Welcome to Abacus - the latest offering from the most Awarded property owners in Bright. It is a stand alone 2 bedroom house surrounded by its own fully fenced, private, mature garden. There are no other guests staying on the property so peace, privacy and tranquility are absolutely assured. Every room is filled with light and all windows look out onto your own magnificent garden. The ceilings are high and the whole ambience is of space, light and quality. Peaceful country walking is guaranteed with the Ovens River and miles of car-free riverside walks 5 houses away at the end of the court. The property is unique in Bright. It has been set up specifically for adults and their pets. Everything is of the highest standard with quality evident everywhere you look - and yet we still welcome pets. Extraordinary but true! Unfortunately children and babies are unable to stay. Fire with unlimited logs provided. A garden table romantically hidden away under the branches of one of the huge garden trees to escape the summer sun. Council regulation limit the number of pets to two (unless they are teensy – ring to enquire). We are the winners for 12 years in a row of the Award for Best Pet Friendly Holiday Accommodation in Australia (not just Victoria although we won that too). 5. Tessies House & Studio combined - sleeps up to 8 - 4 bedrooms/3 bathrooms -from $510 per night - perfect for everyone - all generations - kids, families, friends, pets - the works. All of our properties are brilliantly conceived and a perfect retreat for the discerning traveller. All properties are located in quiet tree lined streets close to town and the river. All have magnificent fully fenced private gardens. All are pet friendly. There are no other guests staying on the property so peace, privacy and tranquility are absolutely assured. The two bedroom stand alone property is surrounded by its own fully fenced, private, mature garden. Every room is filled with light and all windows look out onto your own magnificent garden. The ceilings are high and the whole ambience is of space, light and quality. Peaceful walking is guaranteed with the Ovens River and miles of car-free riverside walks at the end of the street. There is also a huuuge dog park 5 houses away. The property is only suitable for adults & their pets. Unfortunately children and babies are unable to stay. Beautifully appointed home. Lovely quiet spot close to the action of the Main Street. This property is nestled in a quiet court. Large living area and open plan kitchen as well as fantastic bathroom. 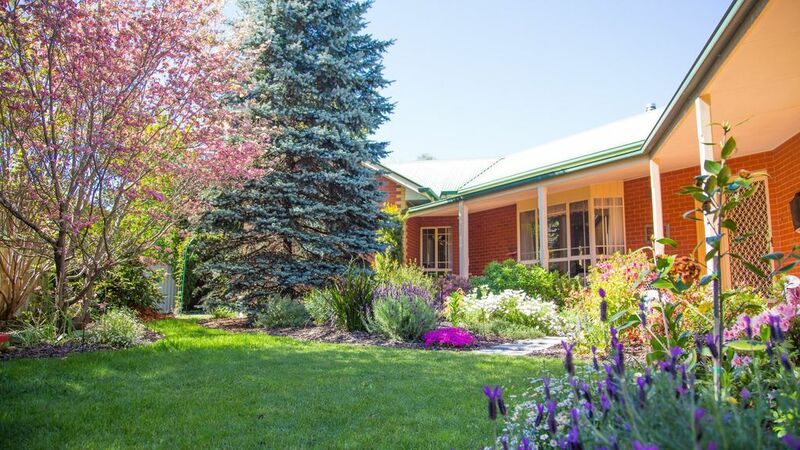 Beds comfortable and verandahs on both sides of the home looking out upon well established pretty gardens. These make for a perfect spot to eat lunch or read a book. We’ve stayed in lots of pet friendly accomodation over the last 15 years. This one is top 5. A lovely home that welcomes you and you can relax immediately - warm cost fireplace, clean and spacious with everything you need - a home away from home. Close to everything and a very quiet spot with lovely walks nearby. Just a great warm cosy inviting home - so easy to relax in. We loved this house so much. Everything was just fantastic - comfortable beds, great kitchen, beautiful garden and super clean. We loved this property. The location was great - we could walk everywhere so easily. The house was really nice and comfortable and had everything we needed. Highly recommended. Immuculate, modern, comfortable and romantic cottage. Providing essentials as well as indulgent luxuries on arrival to a heavenly placed bolthole where you can be as immersed in or romote as you prefer. Catherine is a wonderful hostess, genuinely caring for all her guests needs above and beyond. Thank you for sharing your wonderful home and allowing us to experience an idyllic country lifestyle. We will definitely return. This place is fabulous. Its a lovely house in a beautiful setting. The most relaxing holiday we've had in years. The property is located at the end of a quiet court with off street parking right at your front door. It is 6 minutes easy flat walk into town. You can walk in along the Ovens River looking for the family of platypus, or you can walk along the well lit streets. Perfect for walking home from restaurants at night. Visit the wineries either for a free tasting or a meal. Walk on Mt Buffalo. Swim in the Ovens River at the end of the street. So many things to do. We give you two pages of local knowledge and insider tips when you book.